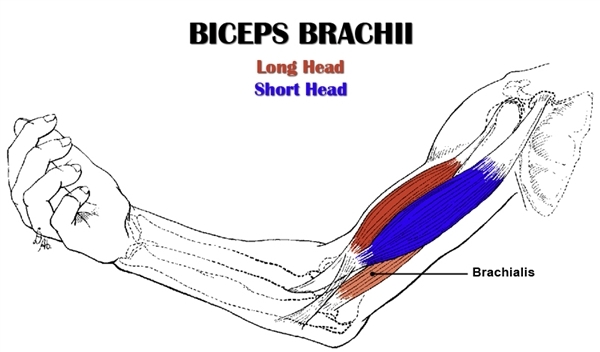 The biceps anatomy includes the biceps brachii and the brachialis. Learn about both of these muscles, their locations and functional anatomy. This page contains an overview of the biceps muscle group. The two heads (i.e. distinct collections of muscle fibers) of the biceps anatomy vary in length, and so, they are known as the short and long biceps heads. They connect to different places on the shoulder/scapula region, but have a common insertion point on the elbow tendon. Elbow Flexion. Bending the arm at the elbow joint. An example of this is when you do a class arm flex to try to impress your friends. Forearm Supination. Rotating the forearm and hand from side to side. An example of this movement is turning a key to unlock the door. Curling and Pulling. 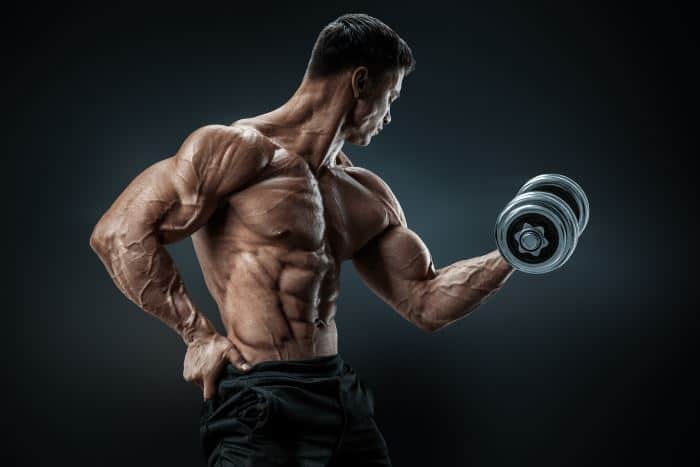 Unlike most muscles on the front of the body, the biceps are involved in pulling and curling movements as opposed to pushing and pressing movements or exercises. Examples of exercises that work the biceps brachii include barbell curls, barbell bent over rows and pull ups. …But being relatively unknown doesn’t mean it’s unimportant; as is the case with many things in the fitness world. The brachialis, which is located underneath and on either side of the biceps brachii, assists in the action of elbow flexion. However, it is unique in that it becomes fully activated only when the arm is flexing, but not actually moving. And so, this muscle is worked in the same exercises as the biceps brachii, but it is only active at a specific point within the movement. please guide me to build biceps & triceps. i am doing workout for last 1 year. Discontinued in between for some time. Check out this article I wrote on how to build bigger biceps.